This lovely vine (Clematis ‘Roguchi’) is the sort of plant you might find at the Rogerson Clematis Collection sale at Luscher Farm on Saturday, 10:30 am to 3 pm. 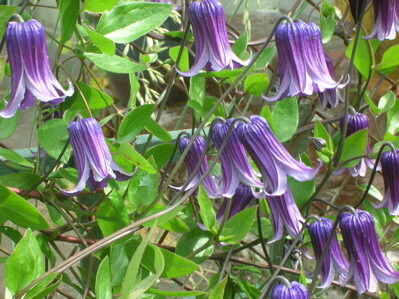 It’s a non-profit organization and plant sales support the preservation of the diverse Clematis collection found there. There will be guided tours, too: check the calendar of events for details. The fourth annual Tour des Plants runs from September 12 to 20, 2009. Organized by the Oregon Association of Nurseries (OAN), this nine-day extended plant party gathers together some 30 garden centers and nurseries for a smorgasbord of promotional events – plant sales, tours, talks, seminars, demos, and tastings of local foods from tomatoes and apples to olive oil and wine. Most events – and tastings – are free. And many classes offer discount coupons or free gifts with purchase. Saturday Sept 12, 19 from 10-12 – a behind-the-scenes tour of Wooden Shoe Tulip Farm nursery. I recently learned they are one of only a handful of Willamette Valley nurseries to be VeriFlora Certified (Certified Sustainably Grown). Saturday Sept 12, 19 and Sunday Sept 13, 20 at 11 am and 1 pm – walking tours of an olive orchard, olive mill and olive oil tasting at Red Ridge Farms (Yup, olives are being grown commercially in the Willamette Valley now.) I haven’t been there yet so you’ll have to drop a line and let me know what it’s like if you go. Thursday Sept 17 at 11 am – a talk by Fred Weisensee of Dancing Oaks Nursery on fall bloomers – and I don’t think he’s talking about autumnal undergarments, either! Later, at 2 pm, he’ll discuss drought tolerant plants – an important subject and one that he is well qualified to speak on, as you’ll see at the garden. If you haven’t been to Dancing Oaks Nursery in Monmouth, get thee hither. It’s a great day trip from Portland and exploring the beautiful hillside display gardens can keep you occupied for many happy hours. Sunday Sept 13 from 1-4 pm – Pinot and Petanque (French boules) at Daryl’s Nursery near Salem on Sunday, Sept 13. He has one of the best funky-art sheds I’ve ever seen! You could also get your home garden soil tested; receive free landscaping advice; take a workshop on constructing a "green wall" (aka living wall), succulent wreath or winter planter; attend a zucchini festival; or learn how to prune hydrangeas – among other things. And the timing’s good, too. While people really want to shop for plants in the spring, autumn is typically better for getting any reasonably hardy new plants established in the ground. The soil is still warm, while cooling air temperatures and increasing rain help minimize stress on newly-planted plants. That all these nurseries are putting plants on sale is just the icing on the cake. So view the map and schedule online, pick up a copy of same (with lots of cut-out coupons to play with) at a participating garden center or call 503-777-1421 for more information.